Become a Pioneer Settler in Catlin, Chemung County, N.Y.---Organize a Conference, which Becomes a Church—Hardships of New Settlements, and Kind Feelings between Neighbors—Enlarge my Field of Labor—Am Licensed to Preach, and also Ordained to the Gospel Ministry—Elder Caton, and his Ox-Sled Trip—Seneca Association, and its Churches and Houses of Worship—"Bag with Holes," and "the Sound Thereof"—Elder Gillette, and the Big Flats Members—New Churches, and Branches of Churches—Purchase a Horse, and Extend my Travels—Management of Household Affairs—Plans for Promoting Christian Faith and Works—The Masonic Controversy—Steuben Association—Elder Bennett—Elder Lamb and his Flock. This was in the Spring of 1826. Mr. C. had taken up the lot adjoining, and was about to move on it. I made my boarding place with that young, married family—a family which has always had a very warm place in my heart. He was the son of one of the deacons of the church to which I belonged, in Covert. I went to work, with a will, on my new lot—where not a stick had been cut—built me a log house, cleared four acres smooth and clean, and sowed it to wheat that fall. I moved my wife and children into my new house, and we felt happier than we had ever done before since we crossed the Atlantic, although we lived that winter without either door or windows in our house. We had our cow, and she was permitted to range the large field without enclosure. I think it was the second Sabbath after I went into the woods, in the spring, that I saw a man who asked me if I did not want to go to meeting? I replied, "Yes, but where is there a meeting?" He said, "On the side of the mountain, this side of the inlet." That, I think, was about one mile and a half from the present village of Havanna. The old gentleman who was to preach, was Eld. Sted. He said some good things, and some very strange things. After the sermon, according to almost the universal custom of the day, a prayer was called for, and opportunity given for exhortation. The minister asked me my name? I told him, and then inquired, "Do you preach here again, next Sabbath, my brother?" He said, "No, sir." I said to him, "Will you say to the people that I will preach here, if God will, next Sabbath, at two o’clock in the afternoon?" He gave the notice that "Brother Shwovenshear" would preach there next Sabbath at two o’clock. He got my name all wrong, but I did not stop to have him correct it. I found he had got a Shear into it, so I concluded it would answer every purpose. I felt in that little log school house, with a few people around me, that I was in the very height of earthly felicity. From that time onward, I preached wherever a few individuals could be gathered together. Shortly, I began to say to myself, "Is it not time that I began to look around and see how many Baptist brethren and sister I can find?" The town was twelve miles by six in size. All I could see or hear of, were seven, with my wife and myself. I felt encouraged, and thought that presently I would get them together and form them into a conference. Settlers began to come in pretty fast, and we finally formed a conference. "Organized by appointing Eld. J. Reynolds, Moderator, and Bro. 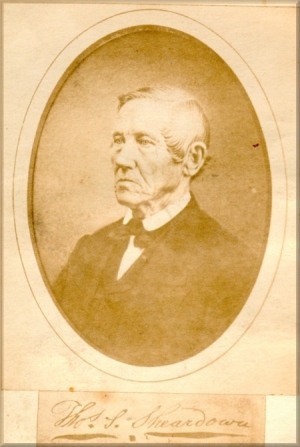 T. S. Sheardown, Clerk. When the following brethren and sisters presented themselves: Brn. A. Vandeventer, J. Wixon, W. Dewith, P. Tanner, D. Weed, T. S. Sheardown; Sisters A. J. Pierce, C. Vandeventer, S. Lafever." Mrs. Sheardown was unable to attend that day, but joined afterward. By this time, a great change had come over me. I was as familiar with the country as though my parents had been frontier settlers. Every few days, people were coming in, wishing to be taken into the woods, with the view of purchasing land. No matter what we were doing, when any person called on such an errand, it was always a rule with settlers to drop everything else and spend a day, and if necessary even more, in tracing lines and showing them what was for sale. I felt as much at home in such business as I ever did in the streets of a city in the old world. We were very anxious to have people settle among us, and never grudged the time that we devoted to such purposes. The first of the settlers were generally young married people, from between the Lakes. I had become practically acquainted with the labor of a back-woods-man, so that all the people were willing to change works with me. I could do a satisfactory day’s work at chopping, and stood "A-No. 1" as a logger. Of course, we had our privations, but we bore them with manly courage; and this taught us how to appreciate and enjoy the few blessings by which we were surrounded, with thankfulness of heart. When we were in our incipient state as a settlement, we had a great distance to go to mill. One man proposed to build a grist mill, if the settlers would turn out and help, which they very willingly did, without pay or reward. This made it very convenient for us, providing we had anything to take to mill, (which was not always the case.) I was solicited to teach three months’ school, one winter, in the place known to this day as Crawford’s Settlement. It was about two miles from where we lived, to the school house, the path (or sled road) the greater part of the way winding through the woods. The going was pretty bad, having had some snow and rain, and there were several slough holes in the path, which made it considerable of a labor, but nothing discouraging: all was bright and hopeful beyond these small difficulties. A Day’s Work At Mill, School, &C.
One morning, Mrs. Sheardown said to me, "I have baked up the last meal we have got." I had two bushels of corn that I obtained from between the Lakes. I shouldered the two bushels of corn, and took it to the mill, (which was three-quarters of a mile or more, beyond the school house;) then came back, taught the day’s school, and at night went and got my grist and backed it home, so that we could have some meal for supper: for this was all the bread stuff we had in the house. This was hard work, but still we remained hopeful for the future. To redeem a world from hell." My "stent" would often be done before my wife gave the signal for breakfast. I was always in the habit, let what come that might, of attending family worship before breakfast; because I found my children, and any persons who might be in the family, would be on hand at meal times; consequently, I never was troubled with any scattering of the family after breakfast. Perhaps there never was a more friendly, congenial class of people, than those who became settlers on that new tract. Although most of them were unconverted people, yet they were a kind, frank, sympathetic class of men and women. Aristocracy was unknown. We were very much alike as it regarded our means of living. We often had "back-woods sociables," but they were different from the "sociables" of the present day, for then we had no tattling, bickering, or backbiting. We appeared to know nothing but pure friendship and sociability, and seldom had an evening gathering but that religion was a topic of conversation. Even wicked men wanted to know something about the Bible, and they knew that I was willing to give them my opinion, and the reason of that opinion founded upon the word of God. We were blessed with a community (both males and females) who loved to sing, and we would sing the songs of Zion with such power and pathos that a person might have thought we were training ourselves to sing in that better world. Then we attended prayer; and, if very dark, we lighted our torches and wended our way through the sturdy forests to our respective homes, the fathers carrying the babes, and the mother’s tongue continually going, "Do see that young one don’t get cold—feel of its feet." Those were mothers indeed, very tender of their offspring. And a blessed thing that they were, as things have turned out, for they were doing a great business, which has only been developed since the commencement of this wicked, Heaven-daring Rebellion. I have no doubt but many of those infant boys, that were thus carried in the arms of their fathers, have made their mark during this awful war, for I know of some of them who have. I was acting as school commissioner. In the extreme northern part of the town, there was what was called a "half share school district;" that is, the school house was located in the town adjoining, and the district made up of parts of the two towns. This made a great deal of trouble. Judah would envy Ephraim, and Ephraim would vex Judah, and the commissioners from the two towns were often called to settle some difficulty. On one occasion, it was so late before we got through with our business, that I had to stay all night, with Esq. Tracy, at whose house we met. After the other commissioners had gone home, I commenced talking with the ‘Squire about the interest of his soul. I found him an intelligent man, free to converse the subject, and we talked until a late hour in the night. I felt, that night, as though, indeed, I was about my Master’s business. He said to me, "Sir, don’t you preach sometimes? I think I have heard of your preaching in Crawford Settlement." I told him I tried to. In the morning, before I left, (which was very early,) he entreated me, with a great deal of tenderness, to come and preach at his house. I told him I would be very glad to, and that, if I should be called there again on business, I would arranged to preach at his house in the evening; and I very soon had the privilege of doing so. I began to feel, then, that my field of labor was extending well to the north. Invitations began to come from the Beaver Dams, and from some parts of the adjoining towns west of us; so that I found myself under the necessity of going out several evenings every week. I had planted the banner of the Gospel at headquarters in Crawford Settlement, and that I always reserved for my Sabbath morning appointments. While thus engaged in preaching, one of the deacons from between the Lakes (a member of the church where I had my standing,) came out to visit one of his children. He stayed over the Sabbath, attended meeting with us, and we had a good time. I felt strong in the Lord, and the in the power of his might, and was very much comforted by the presence of Deacon Cole. The church in Covert had heard that I was preaching, and at one of their covenant meetings it was proposed that I should be called to order because I had said nothing to them upon the subject. When they had made their remarks (some of them) about calling me to order, Deacon Cole arose and said, "My brethren, let Br. Sheardown alone; God is with him, and he will ultimately do a great work in that new country." My old confidential friend, Dea. Porter, remarked, "I agree with Dea. Coles. I have long thought that Bro. Sheardown was just where God would have him; and, for my part, I believe all will come out right in the end." The Lord had sent in among us, here and there, a few Baptists. We appeared to gain a little strength, though there was nothing very elating, only that every individual who could, would always attend meeting, whether it was preaching or prayer meeting. We never wanted for a congregation, winds blow high or low. And thus all move on, laboring at their daily avocations, and toiling in their moral calling as professed brothers and sisters in the Lord Jesus Christ. We concluded, when we numbered nineteen members, to organize ourselves into a church, to be known as the First Baptist Church in the town of Catlin. The preliminary steps were taken, with much prayer, and great searching of heart. I wrote the Articles of Faith and Covenant, part of them by the light of my burning log-heaps at night. Having obtained letters from our respective churches, we perfected our voluntary organization, May 31st, 1828. Next, invited a council, to see if they would fellowship us as a Baptist Church in regular standing. At the appointed time, (June 25th, 1828,) the council came together, in the barn of Bro. A. Vandeventer. It was a time of trial for me. I had been, to the Conference, as pastor and clerk; in fact, all its business had gone through my hands. I wrote the letters of invitation, and signed them by the authority of the church. The council was principally gathered from between the Lakes. I think all the ministers, except one, were from that region. When the council was organized, and ready for business, one minister arose with a letter in his hand, saying he should never have stirred one inch to come there, if it had not been that he concluded that it was sheer ignorance of the individual who wrote the letter. I began to feel very intense upon the subject of ignorance. I was aware that I knew but little, but I was not aware that there was anything betraying ignorance, neither was there anything incorrect, in the letters that were sent. He was asked, by one of the brethren of the council, where the difficulty lay? He replied, "Your letters can not be like mine, or you would have seen it at once." He then pointed to the letter, as he held it in his hand, and said, "See here!" (beginning to read:) "The First Baptist Church in the town of Catlin, to the Baptist church of (such a place,) sendeth Christian salutation. Beloved brethren, we invite you to send your pastor and chosen brethren to sit with us in council, to see if you can fellowship us as a regular Baptist Church." "Now," he said, "I never before saw such a letter as that, in my life. If they are a church, what necessity was there of sending for us? I always thought that letters were sent to call a council or organize a church." I had been appointed by the body (the church) to be mouth for them. I told him, as I understood it, it was our business to "organize" the church, then to call a council to see if they could fellowship us as such; but no council could make us into a church, if we were unwilling, on our part, to enter into that relation. There was a great deal of pro and con in the council, among the lay brethren; the ministers said but little. Finally Eld. Abbott, of Covert, arose, and said to the objecting brother, "If you have come here with the intention of helping to make a church, you might just as well have staid at home." This led to further altercation; but finally the council decided that the letters were correct. Then they called for our Articles of Faith and Covenant. There was one Article which embraced remotely the doctrine of the pre-existence of Jesus Christ. The brother who was in so much trouble about the letters, was now in more trouble about the doctrine, stating that whoever composed that Article was an Arian. The inquiry was made of some of the brethren, where they got the Articles of Faith. They told them that Bro. Sheardown wrote them. At once, the objector pronounced the doctrine to be heterodox. I told the council, that, inasmuch as I was responsible for the doctrine inculcated, not to get into litigation over me, but set me one side; and if the council thought best to expunge the article, or to alter its phraseology, all right; but to fellowship the little church, for that was my life. The council almost unanimously agreed that they could not fellowship the church unless I was an integral part of it. It was proposed by some of the council, that the objecting member should write an Article in place of the one that was the subject of dispute. It was written, and presented to me to see if it would meet my approbation as well as the one that was inserted in the church’s Articles of Faith. I told them that the doctrine involved in the new Article was Unitarianism. This led to further debate. Eld. Abbott said he would write an Article that Br. Sheardown and the council would all coincide in. It read as follows: "We believe that Jesus Christs ever was, is, and will be the medium of communication from God to His people." I told them that I was perfectly satisfied with that, and thought it far better than the one I had written myself. Then the council moved on, and fellowshiped us as a church. This was indeed one of the hard days of my life; yet, after all, a day that afforded the greatest satisfaction, perhaps, of any. At their covenant meeting in July, 1828, the church gave me a formal license to preach. We had in our little church a brother and sister from Romulus, Seneca county where they had been under the pastoral charge of Rev. John Caton. Bro. Caton was a very large man, in body, mind, and will, and imbued with all the spirit of the Revolution. He was once on the staff of Gen. George Washington; and a man who had been so near the father of a nation, may well be considered of some importance. This brother and sister had been down to visit their friends, and they had told father Caton some of the peculiarities of the Englishman who was preaching to them in the woods. The old gentleman said to the brother, "Is your minister sound?" He replied, "I think he is." A short time after, the brother was going down again to see his mother, and said I must go with him, and preach to Eld. Caton’s people. I concluded to go; and the first thing after we had arrived in the place, the brother went to Eld. Caton, and told him that his minister was out with him, and, if he thought best, he should like very much to have him preach that evening. The Elder said: "My brother Abraham, is he sound? There are so many of these young upstarts who are rotten Arminians." The appointment was talked up, and the Elder concluded, as he was rather infirm, that he would have the services at his own house. He said, "I do not think it best to make much fuss about it; and if it was to be in the school-house, there would be a great many people turn out, if they heard of it, who, perhaps, would not come to my house; and I should like to hear the man for myself." I had made up my mind, if I preached, I should preach on faith and repentance; but I must do something to convince the old father that I was "sound." Consequently, after I had named my text, I employed, as an exordium, a long quotation from Paul to the Romans and Ephesians, relative to the purposes of God, embracing the doctrine of election, and justification by the imputed righteousness of Jesus Christ. This lubricated the old gentleman’s throat so effectually, that he swallowed down everything I said relative to man’s accountability, and the sinner’s obligation to repent of his sins, and believe on the only begotten Son of God, so that he might be the happy recipient of the hope of eternal life, which God, who cannot lie, promised in Jesus Christ before the world began. As soon as the remarks were ended, the Elder rose up in his majesty, and endorsed the doctrine, eulogized the young speaker, and told how thankful he was that he was not trammeled with Arminian stuff. When we parted, he promised, if Bro. Abraham would come after him some time, he would make us a visit, and preach for a week, on condition that he could be carried from palce to place, so that he might preach every day as long as he should stay with us. Of course, all this was agreed to. In the fulness of time (December 1828,) Bro. Abraham arrived with his former pastor. We were much rejoiced at the coming of the patriarch. All were ready to make him as comfortable as their circumstances would admit; and he appeared to be well pleased with the attention paid him. He being very corpulent, as well as aged, we always minded to give him a good locality in the ox-sled, by which we moved him from place to place. After having attending a meeting in the afternoon, (when he preached plump two hours, if not a trifle over,) we were to travel two miles to the meeting in the evening. Bro. Abraham figured largely amond the friends, doing all he could to make everything go off right, so that Eld. Caton would give a good account of us when he got home. We loaded up our precious freight—Domine, brethren, sisters, and children—(for we must always have the children along, and this was a very prolific place)—and commenced our passage to Bro. Abraham’s, to be ready for the evening service. Our path lay all the way through the woods, just wide enough for a sled to pass, winding about amongst the trees. After we had reached the summit of a rise of ground, we then had a descent, some parts of which was very steep. The oxen found the draft was over, and, as the sled began to crowd a little, they had an inclination to run away. Abraham, the pilot, hallooed at the top of his voice, "Hwo! Hoi! Gee!" but the oxen minded not. Increasing their speed at every step, by some means they caught the sled against a sapling, which swept off the temporary box, and all the passengers, into the snow, except the minister. I started with all speed on the track, (for then I could run like Cushi,) expecting every moment to find our guest lying in the snow, if nothing more or worse. After having run three-quarters of a mile or more, I saw, on the plain below, the breath of the oxen rising up like the smoke of a furnace. They had stopped of their own accord, and lo and behold! There sat the good old man with his feet stretched out before him upon the only bottom board left on the sled, with his hands clinched, almost with a dying grip, on each side of the board. And he had held on, for the prespiration was standing in drops upon his face. After we had loaded up again, and got the old gentleman to the house, he appeared to wake up to the circumstances through which he had passed, and exclaimed: "I have had a great many rides in my life, but I never before had such a ride as I have had this afternoon." However, he concluded, after all, that he had come out the best of any of us, for he had ridden while we had to walk, and run after him through the snow. But this was about summing up of his labors with us. He has long ago entered into his rest. Recalling those incidents, leads me to notice, here, the situation of the Baptist churches in that garden of the State. I may often refer to circumstances that happened among them, inasmuch as it was the region of my first settlement in America. There are many things that are riveted upon my mind, some of which I hope never to forget, in this world or the world to come. I think the church in Romulus was the first Baptist church between the Cayuga and Seneca Lakes, and was organized in 1795. By whom gathered, I have not the means of knowing: but I do not think that that church ever sent out branches. The Covert church appears to have been more fruitful. This church was organized in 1803. She covered a vast territory. In 1853, I was invited to attend her jubilee meeting, (the 50th year of her standing). The pastor, Rev. C. Wardner, was requested to present a history of the church. I was requested to talk upon the subject of the Seneca Association, of which she was a member. I had known more or less of the movings of the Association from the day of its birth. I think I was present at its first annual meeting; but, being a stranger in a strange land—alone, while in the midst of hundreds, knowing no one, and but few knowing me—my spirits became depressed, and I returned home before the session closed. If my memory serves me, it was held in Farmerville, in 1822. I believe there was but one Baptist church building (or meeting house) between the Lakes, when I settled there. There might have been another, but I do no know of any except the one at Covert; and that was a rare model of architecture for the time. The people went into the gallery from out of doors, going in at the gable end of the building. The first time I saw it, I could but admire the patch work. It was not, I believe, plastered all over: only here and there a patch put on, and everything else about it appeared to be in keeping with what is already named. The centre of the church was at Thomas’ Settlement called so after their first pastor, Miner Thomas. They had a covenant meeting, not only there, but they had another at the house of Thomas Horton, at the head of Seneca Lake, about twenty miles in a south-west direction. They had another, I believe, in Virgil, Cortland county, (in about a south-east direction,) which must have been some thirty miles from the common centre. I think they had another in Ovid, on the north, between Covert and Romulus. This certainly gooes to show that that part of the country must then have been sparsely settled. It also implies that the pastor must have been a very laborious man. In the best sense of the word, Covert was a "mother church." She had begun to marry off her children just before I came into the country. In 1817, the church in Enfield was formed. The same year, the church in Mecklenburg also was formed. In 1820, the church in Trumansburg was formed. In 1820, the church in Newfield was formed. In 1821, the church in Lodi was formed. In 1828, the church in Ovid was formed. In 1838, the church in Danby was formed. There are others, the time of whose organization I do not recollect, neither have I any means of knowing. In looking over the ground, now, I am ready to say, "What hath God wrought!" If we commence at the head of the Cayuga, we find a good Baptist meeting house in Ithaca, and starting from that point we will pass through to the outlet of the Cayuga and Seneca Lakes. We find respectable meeting houses in the following places: Newfield, Mecklenburg, Bennettsburg, Trumansburg, Covert, Peach Orchard, Farmerville, Lodi, Ovid, Ovid Village, Romulus, Fayette, and Seneca Falls. There was one in Waterloo, but I believe, for want of good financiering, it was finally sold, and whether they have ever built another I do not know. Also one in Geneva. Truly, the Lake country is the land of Baptists. The greater part of this territory is covered by the Seneca Association; and although it is years since I have traversed that delightful portion of the country, yet the blessed scenes through which I have passed, in the school houses and barns, before manyh of thos church buldings were erected, have left a deep impression on my mind. I have preached in nearly all the meeting houses above named. Several of their dedications I attended, and have held protracted meetings with them, the remembrance of which is as cooling waters to the thirsty soul. When the churches of the Seneca Association took me by the hand, as pastor of the Catlin church, and gave me that hearty welcome, which spoke loudly to my inmost soul, with their hand I had their hearts also. And at this late day, notwithstanding so many of the older brethren and sisters have passed away, I love the churches still, and am ready to say, now, if I forget you, let my right hand forget her cunning. I shall have occasion frequently to look over that field so dear to me. Returning to the church at home, I find that on December, 1828, (the same year I was licensed) the church invited a council to confer as to my ordination. The council met and I was ordained. The proceedings of this council are appended to this narrative. Havin occasion again to go to Esquire Tracy’s, on school business, an appointment was made for me to preach, the following Sabbath, at Miller’s school house, within the town of Reading. I found an old gentleman there, a Presbyterian minister, who, though to me a stranger, proved to be a very fine man. He said, by right of appointment, it was for him to preach: but, inasmuch as the people had come together expecting to hear me, I must preach. That led me to leave another appointment. I continued to go to that school house, about once a month. My foreign accent, and my old country appearance, if nothing else, induced the people to come together. This was an older settlement than the one in which I lived, sout of it, and the people very generally came out to hear. A Baptist woman in the congregation, made herself known: she lived four or five miles down the Lake; she said her husband was unconverted, and she had long been praying for him. In the congregation were two good men, originally from the East, where I believe they both held the office of deacon, or ruling elder. The great difficulty, here, was, that they wanted somebody to rule over, for there were but very few professors of religion in the place. On one occasion, I preached from the text, "And he that earneth wages, earneth wages to put into a bag with holes." As soon as I had concluded, one of these men arose and said, "If you have preached the truth, sir, I ain’t a Christian—I ain’t a Christian!" The answer was, "I do not know whether you are or are not a Christian, but I know I have preached the truth." Nothing more took place at that time. The Baptist sister was in attendance with her husband, and he, being a wild, jocose sort of a man, kept joking her, all the way home, about her religion being in a bag with holes. He said that old uncle D. found that all his religion had run out, and did not think he was a Christian. When the time rolled around for another appointment, the man said to his wife, "Let us go again and hear that fellow who preached about the bag with holes." They came, and she introduced him to me after the services. I said a few words to him about his soul, and the necessity of immediately seeking the salvation of God. I saw the muscles of his face twitch, and his chin quiver; he turned his back, and abruptly walked away. I felt that God had fastened his own truth in his heart, as a nail in a sure place. The next time I spoke there, I saw a female, apparently about in middle life, very much exercised. Some times she would weep bitterly, and at other times would smile almost to laughter. As soon as I had said amen, she arose and exclaimed, "And thou shalt hear the sound thereof—and thou shalt hear the sound thereof!" Everybody was aroused by her apparent energy of expression, and (as they said) disturbing the meeting. It was with difficulty that I could get her so composed as to find out what she meant. She said, for many days she had felt herself such a sinner that there was no way for her but that she must go down to hell. She proceeded to give a relation of her trials, and the course she had taken. She went toe Eddytown, a small village about a mile from where she lived, to lay her case before a minister. He told her to stop her crying—there was no necessity for her to be so—it was just as easy to get religion, as it would be for her to turn her hand over: all (he told her) that she needed, was barely to resolve to lead a better life. She resolved, and re-resolved, but felt worse and worse. When she got to her father’s (for she was a maiden lady) her brother-in-law was there, and was telling about a strange kind of a man, preaching at the Miller school-house, near Irelandville, who had been telling the people a long story about a bag with holes. She said to her brother-in-law, "I must go and hear him—when does he preach there?" He replied, "To-morrow—and if you want to go, I will take my team and carry you, for I want to go, too." She remarked, that, all night long, she walked the room in the greatest agony of soul. The words she uttered in the congregation, came to her mind—"and thou shalt hear the sound thereof." She never thought whether they were in the Bible or not. As the time approached for her brother-in-law to call for her, she was so fearful that he would not come in season, that she started afoot and alone, all the time having this impression—"And thou shalt hear the sound thereof." I think she said there was no one at the school-house when she got there. It pleased the Spirit of God to take of the things which are Christ’s and show them unto her. She went home rejoicing in the Lord, and told every one she saw what great things Jesus had done for her. She scattered the blessed fire for nearly ten miles along the Lake road. The next thing was, that invitations began to come in to preach in certain places on that road. The husband of the sister previously referred to, was under pungent conviction, and entreated me to make an appointment at his house, with which I had to comply. These were the first stores gathered from nature’s quarry to be put into a new organization, for it was the starting period of the beloved church in Reading. Although I had a great many different places to preach at, and no way of going, then, except on foot, I always preached three sermons on the Sabbath, minding the places were not so far apart but that I could reach them at the appointed time. Previous to this, we received a visit from two brethren of the Big Flats church, south of us. They had heard that there was somebody preaching in Moreland, and came ten miles to see what we were doing. They appeared to enjoy themselves, and when they left, said they would give a good account of the land. They promised to come again, on the day of our covenant meeting, the time and place of which we gave them minute directions, so that they might find the house of the brethren where it was to be held without trouble. On the day named, we were all assembled, except those who were sick or away from home; for if any sisters were unable to travel, some brother would go with his ox-team, bring them to the meeting, and carry them back again. Just after singing and prayer, behold! In came our visitors—Dea. John Brown and Cornelius Low. Bro. Low was quite an eccentric man, and always had much to say allegorically. In the course of his highly figurative conversation, he said there was one portion of the Bible which he could never understand; the passage was about Jacob’s flocks—the "ring-streaked, speckled, and brown." In looking at our sisters, he said it was all clear to him. I do know that many of the female members were "speckled and brown," for they were to us, what God intended—help-meets—and were ready to acknowledge it. They spent a great deal of time out of doors, picking up and burning brush, often helping their husbands to brand up their log heaps until midnight; and, to tell the truth (which we always wish to do) they were pretty dark complexioned, varying in proportion to their exposure to smoke, fire, sun, and wind. I have no doubt the good old brother often repeated his exposition of Jacob’s flocks. But we derived some very important information from our visitors. We heard of the state of religion in the valley, and got from them a description of their pastor, Rev. Philander D. Gillette—what a good work he was doing—how everybody was following after to hear him preach—also that he was very desirous to come and see us, but, like myself, he had a very large field, and pretty hard to till. He sent word that he wished to see me, and form an acquaintance. Subsequently, I determined to make his acquaintance. Not knowing exactly where to find him, I inquired, and was informed he had gone up the river, probably to Bro. Bennett’s. I steered my course in that direction, and met a man riding along the road in an old-fashioned wagon, driving a good horse, which Bro. Gillette always did. When he got almost to me, he exclaimed, "Haloo! Is your name Sheardown?" I told him it was. "I knew it was," he said—"our brethren had described you so minutely, that I knew you must be the man: for there is not, I think, another drab coat like yours in the country." I preached for him, that evening, in a school house, and arranged with him for an exchange. From that time onward, our hearts were knit together like the hearts of David and Jonathan. But that exchange was a bad one for me. I preached to the people as well as I could. The very moment I closed, a good old mother in Israel was on her feet. With a shrill voice—(I had often been startled, in the woods, by the sound of the owl, but never did I hear, I thought, such a human voice: and perhaps, after all, it was not so much the voice, as the words she pronounced, or rather screeched)—she exclaimed: "O, Lord! I wonder if this is Elder Sheardown, I have heard so much about? He has only said one word that I was god to hear, and that was ‘Amen.’ O, my Lord!" she continued, "if Mr. Goff could rise from the dead, and hear such preaching where he had preached so often, what would he say?" I was not only, as the sailors say, taken all aback, but I was in a sinking condition. There was about half an hour’s recess, and then I was to preach again. The friends were very kind. One said, "Go home with me, and take some refreshments." Another said, "I live pretty near by—go with me." I told them I did not want to eat, and should not until I had preached again. I saw a pile of straw behind a barn, and crept into it, as well as I could, until my watch told me it was time for me to go to my meeting. How to go, I did not know. I thought I could never stand another such a volley. But I buckled up my harness, and bared my arm to wield the sword of the Spirit again, continually praying that the Lord would deliver me from the fear of the old sister. I preached from Paul’s words, (Rom 8th Chap., 1st verse) "There is therefore now no condemnation to them which are in Christ Jesus, who walk not after the flesh, but after the Spirit." I said a good deal about walking after the flesh. As soon as I said, Amen, the good old lady was upon her feet again. I thought I was surely elected for another shot. But, instead of that, she exclaimed, "O, Lord! Forgive me—forgive me! Such a whipping, I never took before. O, the man has paid me more than double interest!" She wept, and confessed—and I must say, I was very glad to hear her. It appeared as though she could not give up her walking after the flesh. She began to entreat every one to forgive her. I felt somewhat better—but I acknowledge that, from that time to this, I have feared an old woman more than all the Doctors of Divinity before whom I have ever preached. This opened the way for frequent exchanges with Bro. Gillette. And if, on any occasion, I found him preaching in any part of my large parish, it was all right; or, if he found me over the line in his diocese, it was all the same. We labored much together, aiding each other at every turn—neither of us jealous that the other would take the crown, but continually praying and preaching that the crown might flourish on Jesus’ head. After this digression, we will return to the more immediate field of my own labor. I had established a preaching place on Mead’s Creek; on Nash’s Hill; at the lower part of that creek I preached occasionally; also in a region known as Knowlton’s Settlement. These points were in Steuben county, ten to eighteen miles from my home. I had other appointments—one where Millport now stands, in Chemung (then Tioga) county, and another in the town of Reading, before referred to. My traveling was all on my own feet. One severely stormy day—when it rained sleet and snow—I called at the house of a good old Vermont brother, of Revolutionary memory, to take dinner. In walking through the mud and snow, I had caught one shoe under a root, and torn a large hole in the upper leather. After dinner, a son of the old gentleman (a man approaching middle life) said, "Elder, is it not lawful to do good on the Sabbath day?" I answered that the Saviour had taught us that doctrine; "then", he said, "take off your shoe, sir, and hold up your foot." He took a rule from his pocket, and measured my foot for a pair of shoes. "Now," said he, "I am going to make you a pair of Gospel shoes." I remarked to him that I had a pair of Gospel shoes that I had worn a great many years, and they were as good as they were the first time I put them on. But he waggishly replied, "They are not adapted to those feet, or otherwise you would not have had that large hole in your shoe, but I will make you a pair that shall fit your feet, and that will not tear by catching them under a root when they are wet." He made them, and such a pair of shoes; I never had seen, nor worn before; I never wore them out; for after I had worn them long, I finally gave them away to a poor man who I thought was worse off than I was. Soon after this, a door for more enlarged operations opened by a man offering to sell me a horse. Of course, it was a cheap one, but proved to be very good. I only gave forty dollars for the horse; I borrowed a saddle and bridle; and then felt, perhaps, as lofty and well pleased as some of our Generals do when they are fully equipped on their war steeds. Labor was increasing on my hands all the time, and there was nothing for me but to arrange so as to give my whole time to the vineyard of my Master. I could endure, physically, in those days, a great deal. I could walk twenty miles in a day, and preach three times. Often, my evening appointment would leave me some eight miles from home, and a great part of the time through the wilderness; but there was nothing discouraging in that. One Saturday, I was in a very great strait. My appointments were standing for the next day, and I could not meet them short of traveling thirty miles about, and if I did that I must stay out from home over night, which I felt was not duty in the situation of my family. I said to my wife, "Now, I ought not to go to my appointments to-morrow." She replied, "Yes, you must; you can get back to-morrow night, late, can you not?" I replied, "Yes, but it will be very late." Yet she encouraged my heart to go, and had my pledge that I would get back as soon as I could. I redeemed my pledge, and arrived home between ten and eleven o’clock, Sabbath evening. I felt tired, but not tired out. I arrived home at a providential time, but had no rest that night! I will not dwell, at present, longer upon my pedestrian excursions, but return to my horse-back labors. I occupied the saddle during spring, summer, and fall; but in the winter I traveled in a cutter of my own making, which I could at any time build in about two hours. All I wanted was an axe and an inch auger. I traveled, generally, in a covered cutter, the cover nicely woven with hemlock boughs. Taking my auger with me, and a good jack knife, if I happened to break down, I could repair damages anywhere in a very short time, and pass on again, never discouraged at the toils and the dangers of the way. Perhaps there may arise in the minds of some reader the inquiry whether I was "worse than an infidel" in that I did not "provide for my own household?" and what became of the wife and large family, all this time? I will tell you my plan for providing for them. Brethren and sisters were able to do but very little towards their support, and I managed the matter as follows: I hired the best back-woods young man I could find, and gave him the best wages! My object in doing this was, in the first place, to have a man capable of taking care of my family. In the next place, through the winter, he was chopping. I bought a good yoke of cattle, on a year’s credit, but minded to buy in the spring of the year; then he was prepared for a summer’s work; he could break up some ground for potatoes and other roots, get in some oats, and a little corn. When the time came to burn the fallow that he had cut in the winter, he was prepared to aid those who had no teams; consequently, by changing work with himself and team, it brought in a great deal of labor in return; and, as we always logged our fallows by changing work, he generally got his seeding done in good season, from seven to ten acres of wheat. I had all the wheat, and the gifts of my brethren and sisters. So I was enabled to pay my hired man, and have provisions raised to meet all the real necessities of my family. When I was at home, I always doffed the clerical dress, (which, by-the-by, was very simple,) and put on the tow frock and trowsers, and went at it myself, with all my energy, to aid the young man in anything he had to do, either at home or in paying work where it was due from us to any of our neighbors. I recollect, one season, hiring one of the most thorough-going men in all our region, but fearfully profane. My brethren said to me, "Why, Elder, what do you mean in hiring T. E.? He is the worst fellow for profanity there is in all the region, and will spoil all your children." I told them, I thought not! I never had any person around me who did swear, and I did not think he would use profane language with me or with my family. The reply was, "I should be very sorry to trust him." I remarked that I did my own hiring and made my own bargains. When I engaged the man, I said to him, "Now, Mr. E., you are just the man I want, as it regards your knowledge of business and your willingness to do. But there are some things that, if they must be done, I must do them; and there are other things which you must do. Now, sir, you are in the habit of using a great deal of profane language. I never have any swearing around me, or on my place, and I will not hire any man who is addicted to swearing." He looked amazed, stood a moment or two, then said, "It is a bad practice, I can quit it." "I know that, sir; now, will you do it?" He said, "Yes," I replied, "Very well, sir; I knew you could quit it; therefore, it will save me trouble, for I was going to say to you, that if you must swear, leave it undone until I come home; then tell me what you wanted to swear over, and, if I thought swearing must be done, I could, may be, do it better than you. But I am rejoiced that you conclude voluntarily to quit the bad practice. Now, sir, there is another thing: I don't want any individual to work for me who gets angry and unreasonably whips his team, or pounds his cattle with a handspike," etc. He said, "That I can get along with, very well. I know I have been addicted to doing so, but it is a bad way to treat a team." I then remarked to him, "Now, sir, there are other things. One is that the family must have all their wants supplied. If you are told by Mrs. Sheardown that milling must be done, or anything else of like importance, do just as I should, drop everything, and attend to it. There are little things about the house that I might speak to you about, but you have the acknowledgment of all that I am acquainted with, that you have always been, from a boy up, very good to your mother. This will lead you to notice the lesser things. And yet another point, sir, and that is, we try to bring up our family religiously. When I am at home, I read the Scriptures and pray with my family; when I am absent, Mrs. Sheardown does the same; and I want you, sir, always to be in the house at the time of family prayer. Now, if you are ready to make a bargain with me under these considerations, from the information I have received, and from my personal knowledge of you, I am prepared to hire you for one year. What will you ask for your year’s service, taking your pay at the end of the year, except what little you may need for your current expenses?" He replied, "I do not know, Elder; I wish you would say what you will give." I told him that "I had never been found fault with for oppressing the hireling in his wages. I have never given more than one hundred and ten dollars, and do the washing, boarding and lodging; but I think you will suit me, and you are capable of earning more than a common man; I shall entrust all in your hands; as to your labor, I do not want you to make a slave of yourself, and I will give you one hundred and thirty dollars for the year." He appeared to be abundantly satisfied, and so was I. Mrs. Sheardown said he was as kind a man as she would ever wish to have come into her family; everything was done, and done in the time of doing it. Some time before the year closed, he gave good evidence that he was happily converted to God. This was the plan I adopted to support my family, with the assistance of a few dear brethren doing what they could, so that I might give myself more untiringly to the work of the Lord. By this time, the older part of my children began to be very useful, both in-door and out; they were brought up to work, as soon as they were able to do small things; and as soon as the boys were able to use an axe, they were employed in underbushing; those that were lesser, doing the outdoor chores. The girls were equally busy in the house, learning to spin wool and flax, mild cows, etc. In the winter, those that were old enough, went to the district school; and as fast as they grew up, I sent them away to school, or gave them the best advantages we had in our own vicinity. So that, by a kind Providence, I was able to give them a good English education; and my secluded location secured them from the contaminating and corrupting influences so prevalent in more populous places. I always endeavored to impress upon their minds to necessity of preparing to rely upon themselves. We had twelve children, four of whom died in infancy. Of the eight who survived, five were sons, and three daughters. Through a merciful God, I am now able to rejoice that seven of the eight have a hope beyond the grave. I had made a beginning at Reading, and on the upper part of Mead’s Creek, where I thought (under God) I should be able to raise two churches. It was not so clear in my mind that, in any other of my preaching places—whatever might appear in the future—I should succeed in building independent interests. Perhaps I had as well, here, state something relative to my management in those places, remote from the church in Catlin, which was my grand rallying point. Therefore, I would say that, when any individual was converted, if it was possible, he came to the church, told his experience, and was baptized at our regular baptizing place for the church in Catlin. After a few had been brought in, I called them a Conference in their own neighborhood, when, for the accommodation of families and those that had no means of conveyance, the church voted from the privilege of receiving members, in conjunction with a committee sent from the church to act with them; then these were all considered as baptized into the fellowship of the original church. Next, the church voted to grant them a monthly meeting, which we generally termed a covenant meeting, at which meeting as many of the brethren from the home church would attend as possible. The next move was, the church voted that the pastor should break bread to them, as a part or branch of the mother church. Under this process, they grew up, and our view as Baptists became better known in the neighborhood. My places of preaching were in barns, saw-mills, school-houses, private houses, and in the open air, for we very often had such large gatherings that there was no building in the neighborhood capable of holding them. About this time, we gave letters to some brethren and sisters to organize a new interest in the same town in which the mother church had been gathered. This church was known by the name of the Townsend Settlement Church. There were on Nash’s hill, in Hornby, (a town lying west of Catlin) a few brethren and sisters who had once been organized as a church under the missionary labors of Eld. T. B. Beebee; but they had no organization or visibility when I found them: they joined the Catlin church—consequently, those who were baptized were baptized into the Catlin church. All this time, I was gathering more or less at the rallying point on Mead’s Creek. In time, it was thought best for the brethren and sisters on the hill to join the few on the creek. This gave them strength enough to be recognized as a church. I had now on my hands, three churches, besides two or three covenant meetings. The Conference in Reading continued to grow, and the Lord was working by his Spirit in all these places. The question may perhaps arise, how could one man do the necessary labor for the growth and best interest of those scattered over so large a field? In the first place, just as soon as persons were converted, we set them at work, and they worked with a will. They were live men and women. They would have two, three, or more prayer or conference meetings in the week. All would sing who could, and all would pray and talk; and it was no uncommon thing, when the pastor passed his regular round, once in two weeks, or once in four weeks, that he would find, under the labors of those brethren and sisters, two or three hopefully converted to God. They worked, expecting that God would bless their labors. When they prayed, they believed that God would hear them; and one peculiarity of the times was that we had no long prayers, no long talks. They knew when to stop, as well as when to begin. Their meetings were lively, full of the Spirit, and they attracted the attention of the unconverted; so that, whenever they held their little meetings, the house or school-house, whichever it might be, was generally well filled. So we continued to labor on. It was thought best to make an effort, through the brethren in Reading, to prepare for an organization there. There had been once a small church in Reading, but it became scattered, and lost its visibility. There were a few old-school, anti-mission, anti-temperance, anti-everything good persons, who were trying to cling together, but who had no fellowship whatever for what they termed "New-Lights." In January, 1834, a church was fellowshiped, by a council of brethren from between the Lakes. With many mercies, the churches also had their times of trial, unknown at this day, except by the older members. I refer, now, to the days of William Morgan; when the Anti-Masonic and Masonic advocates were so belligerent. While considering the matter, I reflected, that, wherever evil existed, the only reformatory power is to be found in the Gospel of God’s salvation; when that is experienced, it works reform that will be permanent. I well knew that my bark was but small, and it would be safest to keep well in-shore, lest peradventure I should be swamped amid the fearful storms that were beating upon Zion. My desire was, as far as possible, to preach Jesus Christ and Him crucified. For some time, I met with very little opposition or trouble from either party, and thought all was going well. My aim was to run in the middle channel, and steer as clear as possible of arguments and conversations on either side. I desired to save our churches from ruin, for I thought there were good brethren on both sides of the question. I had a preaching place in the suburbs of a little church, within the bounds of my labors. A barn was prepared on purpose for worship through the summer season, with seats for the congregation, and a stand, elevated some two feet above the main level, for the speaker. One Sabbath afternoon, as I was going to this station, I left my horse about a mile behind, to feed while I was preaching, and took it afoot. Up a little rise of ground, in sight of the place of my appointment, I saw quite a crowd in the barn-yard. A brother was walking ahead of me a short distance; when I came up with him I said, "Why, what are all the people doing, out of doors, to-day?" He remarked, "You will find out, sir, that the people are not all out of doors. I presume the barn is full," and he said, I think, "you will find out what it means before you get through. If you ain’t mobbed, to-day, it will be a wonder to me." I inquired, "What is the matter?" "Matter enough," he said. "The Anti-Masons have found out that you are a Mason, and they are determined not to hear you preach. The Masons are here from all around to protect you, and have you preach. It is a well known fact." He added, "that you used to attend Masonic lodges in England." "Well, what next?" "They say it can be proved that you have attended Masonic lodges in this country, and the public will put you where you ought to be." "Well, is that all?" He answered, "No, they want to know what fellowship you have for Masons who are Christians?" "Anything more, sir?" "No. It will be best for you to find the other out by experience." I remarked to him, "Very well, sir. I presume there will be no trouble about this thing." As I passed in through the people, I saw there was a good deal of whispering and blinking of the eye at me. I pressed forward, and, in the majesty of my religion, took my stand, and laid out of my pocket, as usual, my hymn-book and Bible. There appeared to be some commotion, but not much. I remarked to the, "Now, I want to say a few words before I open religious services. Although my congregation, to-day, is much larger than usual, yet I feel a peculiar satisfaction, in looking it over, that I know almost every individual present. I have preached to you, in different places; and I have always had this satisfaction, that, when I looked upon you, you always appeared as though you believed what I was telling you was the truth. I have just learned, as I was walking up the hill, that there are certain statements made relative to me—first, that I am a Mason. Now, then, I tell you, candidly and honestly, that I am not, nor never was, though I have wondered perhaps a thousand times why I was not, for my business life always threw me more or less amongst the Masonic fraternity. I know nothing about them in their organic or individual relations to each other. I understand it is also said to be susceptible of proof, that I have attended Masonic lodges since I have been in this country. This is a grand mistake, or a palpable falsehood. As it regards there being any proof of my ever attending Masonic lodges in the old world, I do not believe that any such proof can be brought. I have yet to find the individual, on this side of the Atlantic, who knew me in my own country. I am not going to deny that I ever was in Masonic lodges in that country. It was very common with the fraternity to have their lodges open, on a part of St. John’s day, for all those who wished, to go in and see their tables set, and the badges, medals, regalias, pictures, &c., which adorned the walls of their dining rooms. When passing those places, I have turned in with others, (for hundreds often went as curiosity seekers.) So that part of the story is true, from my own confession, not from testimony. I have been in Masonic lodges, in my own country; but never in the time of their sessions. There is another thing you desire to know, and that is whether I have any fellowship for Masons who are Christians. My answer to that, is this: I understand it to be God’s work to change the heart of man, and turn him from nature to grace; and now, if God makes Christians of Masons, it would be vain for me to undertake to undo God’s work, and pull down that which I am laboring so hard to build up. As it regards church fellowship for Masons, if a man has more fellowship for the Masonic fraternity than he has for the church of God, I have no fellowship for him as a Christian; consequently, my church fellowship would rest on the same base. Now I feel that I have conscientiously declared to you the whole truth; and I read in you countenances, that this is an honest declaration of fact; we must believe the man. Therefore, I will now preach to you, as best I am able, without meddling with a vexed question that I know but very little about. My great object in coming among you, from time to time, is, that I may do you good for eternity. The Lord bless you. Now we will sing" such a hymn. My congregation was never more attentive, and I do not recollect that from that time onward I ever was called on publicly to say pro or con upon that subject. I was aware that Satan had been at work somewhere, but where, to me was unknown. About a year and a half, perhaps, afterwards, I was preaching in a school-house, when a brother and sister, whom I was intimately acquainted with, were present. She appeared to be very much affected, and said to me, after the evening service, "I want you to go home with us, to-night." The reply was, "It is too far. This has been my third sermon to-day. I have ridden some twenty miles, and my horse is tired and hungry. It is very dark and cold. You must excuse me." She replied, "I can not." At this moment, her husband came up, repeating the same invitation, with great earnestness. From the visible excitement in which they both appeared, I concluded to go. Notwithstanding it was late when we arrived, we must have some supper. The woman appeared to be in tears all the time. She finally took her seat between myself and her husband, and exclaimed, "I can bear it no longer." Of course, I wondered what was coming. She remarked, "Do you not recollect preaching in such a barn, at such a time, when there was a great excitement about you relative to Masonry?" I answered, "O yes, I remember it well, though I have thought of it but very few times since it transpired,"—"Did you ever learn, sir, who got up that report? "—"No, madam, nor I never cared; and I do not want any resurrection of it." She exclaimed again, "I can not bear it any longer! I was the individual who raised that report, out of the rough. O, how it has pressed my conscience! Do forgive me! Do forgive me!" I remarked, "That was very wicked. I hope and trust God has forgiven you. If so, I had much rather be taking my supper, than listening to any confession you may have to make to me." The dear woman had laid off the burden of her conscience, and I judged by her actions her relief was very great. After supper, we all kneeled down and prayed together, and it appeared to me, by her earnest prayer and broken hear, that God had been pleased to pardon her sin. I never loved them any less as Christians. To me, her conduct was conclusive evidence that God had put away her sin. I shall always remember the first Association (except the Seneca) that I visited. It was good old Steuben. When I attended its sessions for the first time, it convened in the old Baptist meeting-house in the town of Wayne, in Steuben county. I was almost a perfect stranger to every one present. There were two or three, in company with me, who belonged to that Association. I was wearing the old, veritable, drab coat, and was invited to preach. Some said I was an Englishman, some said I was French, some did not know who I was, or what I was. I think it was the introductory sermon that I preached. Why it was so, I do not know—whether they had omitted to appoint one, or whether the individual had failed to come. One of the friends with me pointed out a certain individual and said, "That is Eld. Sanford." When I had entered the pulpit, the good old man looked up and said, "Now, you see what a great congregation of people you have to preach to. You young men are in the habit of mumbling, so that half of the people can not hear you. Speak out, young man! Don’t be afraid." In those days, my lungs were very strong, and if showing zeal for the Lord of hosts could be manifested through sound, I was capable of convincing people that I possessed a good deal of zeal. When I was through, the Elder complimented me for having "spoken up." One reason why I loved always to meet with this Association, perhaps, is the fact that I always had to work. Their gatherings were so large, that few if any meeting-houses in their bounds would comfortably hold the people. Therefore, while the Association was doing its business, my place was in a wagon, or under the shade of a tree, and sometimes in a little grove, if there was one near by. If there were two meeting-houses in the same place, we were sometimes permitted to occupy one of them, so that those might hear preaching who were unable to get into the house appointed for the sitting of the body. I acknowledge that I delighted in open air preaching for it was so much in keeping with my labor at home. On one occasion, the Association met in the town of Prattsburg. They had what is termed a log meeting-house, far too small to hold the hundreds of people who had come together, and we repaired to the woods. I was invited to preach the first day. Eld. Alfred Bennett, (so widely known, and so much beloved by the churches, not only as a pastor, but also as a missionary agent,) being present, I invited him to pray before sermon. The sky had been lowering, and there were indications of rain. The thunder muttered upon the distant hills. The good man, when in prayer, appeared to be talking with God face to face. He said, "Now, Lord, thou knowest all about us; in what a helpless state we are. We have no shelter to flee to. We are here to worship Thee. And now, do not let it rain upon us and scatter us; for what should we do?" The thunder appeared to come nearer by—the blue-winged lightnings scathed the brow of heaven—everybody was looking for a severe drenching—but, to the utter astonishment, perhaps, of all present, there was not enough rain fell to cause a man to put his coat on, ( for scores were in their shirt-sleeves,) while the rain continued to pour down all around us, sometimes within a quarter or half a mile of the place where we were gathered. It was proverbial for many years, in that region of country, that Eld. Bennett kept back the rain by prayer. At night, a number of us went to tarry with that man of God, Eld. Lamb. He had raised a good many lambs, and the greater part of them had become shepherds. While conversing with mother Lamb in relation to her family of boys, she said she hoped they were all converted, except Thomas. If my memory serves me, he was the youngest. She wept while talking about the dear young son—said he was a thoughtless boy, very shy of ministers, and had a peculiar aversion to having any one speak to him on personal religion. "I have," said the good mother, "but one hope of him, and that is, when I brought him forth, I know I dedicated him to God." I mingled my tears with hers, for her expressions broke up the deep fountains in both head and heart. Upon inquiring how I could see the young man, that I might have some conversation, his mother informed me that she had found him in the barn-yard. I walked up the lane, and took a seat on the top bar of the fence, so that, if he came out, he must either climb the fence or crawl through underneath. As he came within speaking distance, I inquired, "How do you do, sir?" He made a similar inquiry, firmly and kindly. I remarked, "You have got a pair of beautiful cattle, there." He replied, "Yes, very good, sir." I saw other stock that I could speak well of—for his father was a good farmer, as well as a good preacher—asked the age of a certain orchard, how long his father had lived there, and other things, until his embarrassment appeared to be gone. I spoke of his brother Reuben—what a blessed thing it was that he had been converted in the days of his youth, and had concluded to be a minister of the Gospel! I found him perfectly spellbound—talked to him about his own soul; he wept bitterly—his heart appeared to be stirred. When I returned to the house, he followed part of the way, and I continued my onward pace, pondering what the result of the conversation might be. When it was time to go to the evening meeting, the mother said she could not find Thomas. I said to her, "Do not be troubled about him. You will find him in some solitary place, in-door or out. Be of good courage. Pray on. God will give you your son." When the meeting in the evening closed, most of the people had passed out at the door, and—as in those days we were not blessed with beautiful chandeliers and fine lamps—the home-made tallow candles afforded us all the light we had. In the dimness, some one thought he saw a large dog in one corner, but, on going to drive him out, found it was a young man. I overheard some conversation as I was exchanging words with a friend at the door, and looking to see what was the matter, saw Thomas Lamb, so deeply troubled that he could not speak; his body almost prostrate, through the anguish of his heart. I put one arm around him, and started for home, pointing, as best I could, to the Lord Jesus Christ as able and willing to save to the very uttermost. The night was very dark, and we moved slowly, for he was full as much as I could sustain. We had come to the foot of quite a pitch or rise in the road, and I was almost ready to conclude that my strength would give out before I could get him up the pitch. All at once he lighted up, appeared to have recovered strength, and exclaimed, "How light it is! What a beautiful night!" He said his fears were all removed, he felt the burden of his heart gone, and went home to greet that beloved mother who had consecrated him to God from his birth. On my return, Eld. Sutherland was quite anxious that I should take his road home. The good old gentleman said I must preach in Penn Yan, Yates county. He had the use of the Court House. I do not know whether it was Court week or not, but there appeared to be a number of professional men there. I tried to preach from this text: "And be sure you sins will find you out." I had a very healthful season for the soul, and plenty of labor. In 1838, Steuben Association reported 522 accessions by baptisms, (of which 149 were in the Penn Yan Church) and a total membership of 1891..